Passenger traffic across Asia-Pacific and the Middle East recorded growth in September at +3.4% and +1.6% respectively.India led Asia-Pacific with over +14% gain in passenger traffic from last year. The robust growth rate is supported by strong domestic demands, which grew by +16.5% over the same period. Out of the top ten airports in Asia-Pacific that generated the highest total passenger volume increase from last year, six airports came from India, with the top three being: Delhi (DEL) +10.7%, Bangalore (BLR) +25.8%, and Mumbai (BOM) +8.15%. The overall passenger traffic growth in China for the month slowed to +4%. Both the domestic sector (+3.8%) and international sector (+7.7%) showed signs of moderation. Top airports with the most passenger volume increase from last year are: Xiamen (XMN) +23.5%, Shanghai Pudong (PVG) +3.6% and Nanjing (NKG) +8.4%. Elsewhere in Asia-Pacific, a number of airports were negatively impacted by adverse weather conditions and earthquakes this month, resulting in sharp decline in traffic: Osaka Kansai (KIX) -47.8%, Sapporo New Chitose (CTS) -21.6%. The overall growth of many airports in the Middle East slowed this month as a result of the conclusion of the Eid al-Adha holiday and the Hajj season. Top airports with the most passenger volume increase from last year are: Kuwait (KWI) +12.6%, Doha (DOH) +5% and Muscat (MCT) +6.4%. For the year-to-date, Asia-Pacific and the Middle East grew +7.6% and +2.1% respectively. The pace of growth eased in major aviation markets such as India, China and the United Arab Emirates. The bright spot was in Indonesia where year-to-date growth was +8.7%, driven by increase in inbound tourists and an expanding middle class, and airlines actively expanding international services. 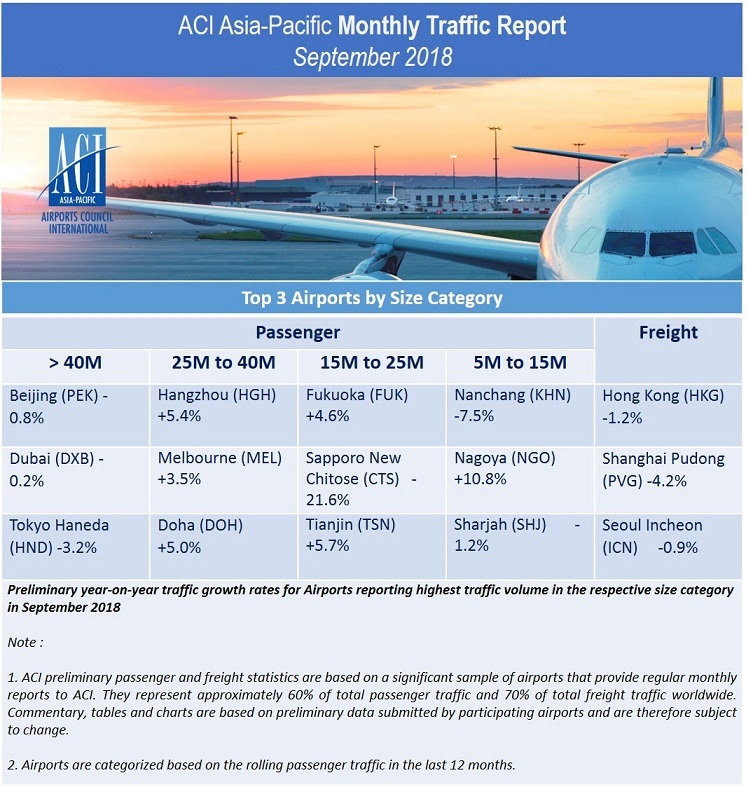 In terms of air freight, Asia-Pacific declined by -1.1% and the Middle East grew by +1.9% in September 2018. Among the major cargo hubs, a number of airports reached double-digit growth from last year: Manila (MNL) +16.9%, Doha (DOH) +14.4%, Jakarta (CGK) +14.2%. Throughout the first nine months of 2018, air freight maintained steady growth in Asia-Pacific (+3.2%) and the Middle East (+0.2%), but showing signs of easing. The shadow casts by ongoing trade war and economic tensions between China and United States is expected to loom over both regions as it enters the traditionally strong fourth quarter.